As we continue to explore the idea of open plan work spaces and the increasing trend which brings the home office to the corporate office, we realize that a common theme here is comfort. Employees want to feel at home while at work and they also want options for both “we” and “me” spaces. This means having a personal desk to get heads-down work done along with small areas to touchdown and collaborate with team members throughout the space in a more informal way. 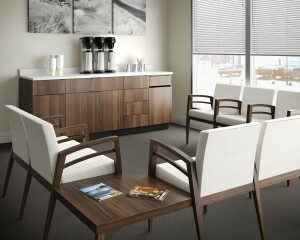 What we often fail to discuss though is the importance of a quality break room for our employees. “It’s important to have a little bit of the Starbucks feel, so that people can sit down and have a morning meeting,” says Rightsize Design Team Lead Tyesha Davis. The space should be large enough to act as a multipurpose area that qualifies as an effective spot to meet for business as well as to relax and eat lunch. Incorporating a sink and a dishwasher is also a plus to keep things tidy and functional for guests and employees alike. Also key, coffee! Having a station for coffee or other beverages is an awesome incentive for employees to get to work on time in the morning and stay focused throughout the day – less Starbucks runs! Not to mention, if you have clients coming to visit your space for meetings, it’s a great ice breaker to be able to offer them a cold beverage on a warm day before you get started. 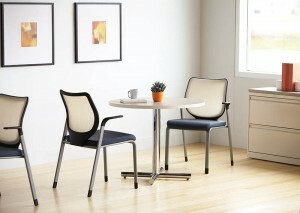 Providing a comfortable area to lounge on lunch breaks is also a nice perk for employees. 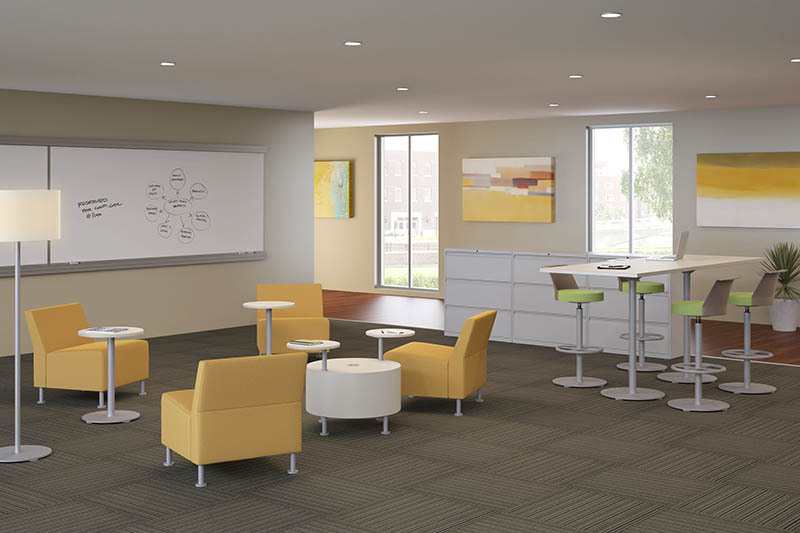 Plus, you can really play up the overall aesthetic of your office by adding different styles of furniture and pops of color to assure people feel good about spending their time in the space. After all, this is a break room we’re talking about so taking an actual break from the panels and computer screens would be enhanced by the privilege to look at some pretty wall art for a few minutes each day. Lucky for you, we currently have a wide selection of modern furnishings on our showroom floor and available for purchase. 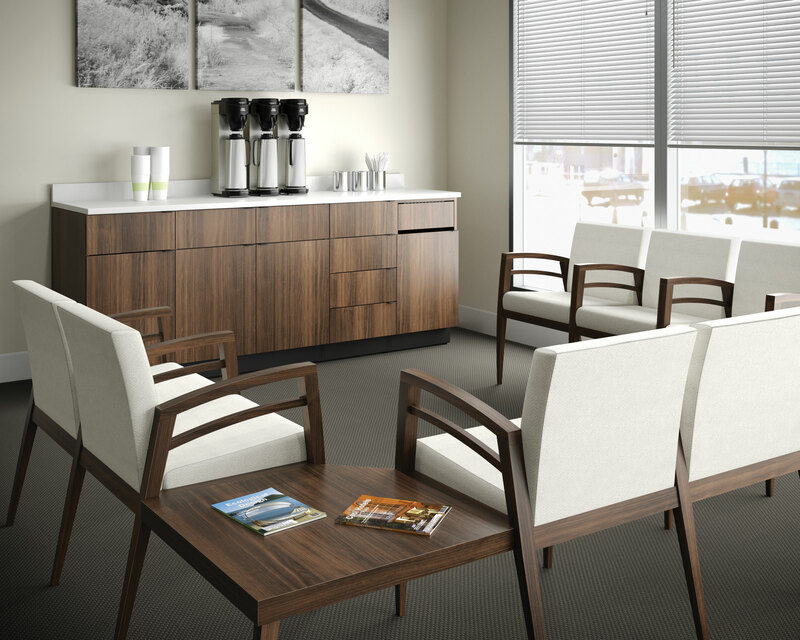 From hospitality cabinets to those trendy lounge chairs and bistro tables, we can help outfit your new – or old – space with the most functional and aesthetically pleasing break area for all of your employees to enjoy. Check out our line list and start researching your options!